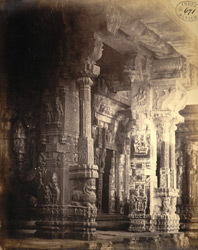 Photograph of the carved pillars within the Venkataramana Temple at Tadpatri, taken by the Madras School of Industrial Arts around 1868, from the Archaeological Survey of India Collections. This temple complex was built during the Vijayanagara period in the mid-16th century. It is entered through a tall pyramidal tower or gopura in the middle of the east side of a rectangular colonnade. The main shrine, dedicated to Vishnu, is preceded by a closed mandapa with two porches. The outer walls are decorated with sculptures representing episodes from Krishna and Ramayana legends, set between pilasters. To the east of the shrine there is an open mandapa with carved piers in the shape of rearing animals with riders and female devotees. The composite carved piers in this view are probably situated inside one of the mandapas.